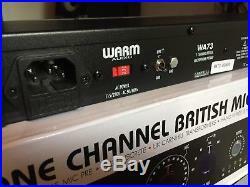 Warm Audio WA-73 British Style Microphone Preamp - BSTOCK. 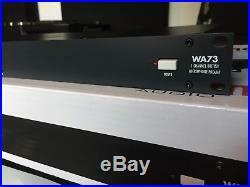 WE HAVE AN EX DEMO WA73 MIC PREAMP FOR SALE. THIS HAS ONLY BEEN USED ONCE, SO ITS PRACTICALLY NEW. 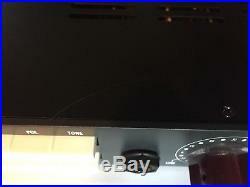 IT HAS A SLIGHT SCRATCH ON THE TOP OF THE UNIT AS SHOWN IN PICTURES HOWEVER, THIS WOULDN'T BE VISIBLE ONCE RACK MOUNTED. Single-Channel Preamp With Integrated EQ. The WA73-EQ utilises Class-A, fully-discrete electronics for optimal audio fidelity. This version of the WA73 boasts an integrated EQ section, designed and developed by Blore Edwards. The versatile design means it can work with a variety of equipment including Condenser & Ribbon microphones. As well as being highly suited to a range of studio microphones, the WA73-EQ is also great for a wide variety of instruments. From electric guitars and basses to drums, percussion, keyboards and more; the WA73-EQ ensures optimal audio performance throughout. The WA73-EQ also boasts an integrated EQ section with custom-designed Blore Edwards switches and potentiometers. The EQ section features a 3-band configuration, allowing you to shape and sculpt your tone for added control. The complex dual concentric switch potentiometers are constructed in the UK by Blore Edwards, who supply military-specification switches and potentiometers. This adds to the precision and durability of the components, ensuring you get full control over your EQ section, with exceptional accuracy. In-Depth Tone Control & Functionality. One of the most unique features of the Warm Audio WA73-EQ, is the hand-wired and hand-assembled design. The comprehensive yet ergonomic control section is comprised of a 80dB gain switch, as well as a Tone button and a 4-position inductor based hipass filter. The Tone control changes the input transformer impedance, resulting in a varied tone for added flexibility, ideal for use with instruments and vocals alike. With 80dB of gain in total, the preamp gives you more than enough headroom to process a range of instruments and microphone types. The hipass filter is great for removing unwanted low-end response, highly useful when it comes to recording microphones and high-end-based instruments. It features a vast range of connectivity, allowing you to connect a variety of external musical instruments and equipment. It boasts an XLR mic input, line-level TRS input, TS Send/Receive insert jacks, as well as XLR & TRS line-level outputs. A direct input is also included for processing and recording instruments such as electric guitars. There is also an output attenuator for controlling your levels with ease. The streamlined and ergonomic layout provides annotated controls with high-quality fittings, optimising your workflow. The WA73-EQ utilises tantalum and polystyrene capacitors and an output transistor choice for a smooth response when the gain settings are pushed. Additionally, it boasts built-in 48V Phantom Power, a Polarity switch, a ground lift switch and a built-in LED level meter. 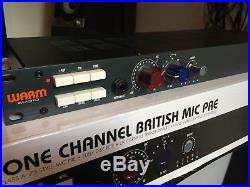 Single channel, class A microphone preamp with EQ. UK made - Blore Edwards EQ dual-concentric switch potentiometers. 80dB of gain - resistor stepped gain switch. TONE button - Changes input transformer impedance for varying tone. Inductor based 3 band EQ. Low Band Boost/Cut - 35, 60, 110, 220 Hz. Mid Band Boost/Cut - 360, 700, 1600, 3200, 4800, 7200 Hz. High Band Boost/Cut - 10, 12, 16 kHz. Additional high band frequency EQ points added. 4 position inductor based hipass filter - 50, 80, 160, 300 Hz. 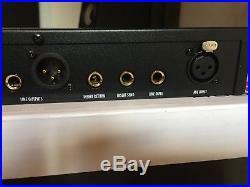 XLR mic inputs (front & back). XLR & TRS line level outputs. Freq response 20Hz - 20kHz +/. Internal IEC 115v/230v power inlet. 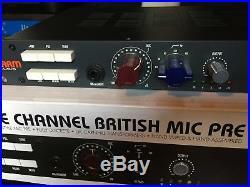 The item "Warm Audio WA-73 British Style Microphone Preamp BSTOCK" is in sale since Monday, July 23, 2018. This item is in the category "Musical Instruments\Pro Audio Equipment\Preamps". The seller is "b-stock_nova" and is located in LONDON. This item can be shipped to United Kingdom, Austria, Belgium, Bulgaria, Croatia, Cyprus, Czech republic, Denmark, Estonia, Finland, France, Germany, Greece, Hungary, Ireland, Italy, Latvia, Lithuania, Luxembourg, Malta, Netherlands, Poland, Portugal, Romania, Slovakia, Slovenia, Spain, Sweden, Australia, United States, Canada, New Zealand, Israel, Norway, Mexico, Switzerland.